The North American QRP CW Club has frequent on the air activities for those operators interested in QRP and CW. This is another fine group run entirely by volunteers. A friendly group of amateurs all sharing the love of CW and QRP power levels. We offer also offer a black ink version for those on a fixed income or smaller QSL budget but still which to have the club QSL. See the link at right to view the black ink version. Please note: Enter your quantity as 1 not 100 or 1 in the 250 quantity. 2 = 200 or 2 = 500 depending on what quantity option you have selected. Our club and net QSLs are designed about the each club or nets widely recognized emblem. This emblem must remain the mainstay of the QSL. Other emblems may be added but please observe the available space before requesting them. A cluttered QSL is not appealing. 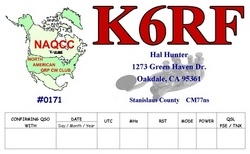 Your choice of callsign (color styles) and cardstock color of your QSLs. 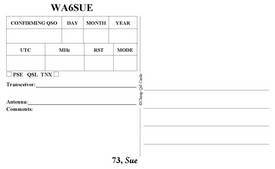 Back Reports are not available on our club QSL Styles. If you have a need for a back report on one of our club QSLs please contact us with your needs. We will quote you the additional work required. These are close as we can present via computer to actual color. All the QSLs we print have this choice of card stock color. We gladly accept PayPal as your payment method.DO NOT use the form above. Click the continue button to proceed to a similiar page with the familiar yellow PayPal Buttons.